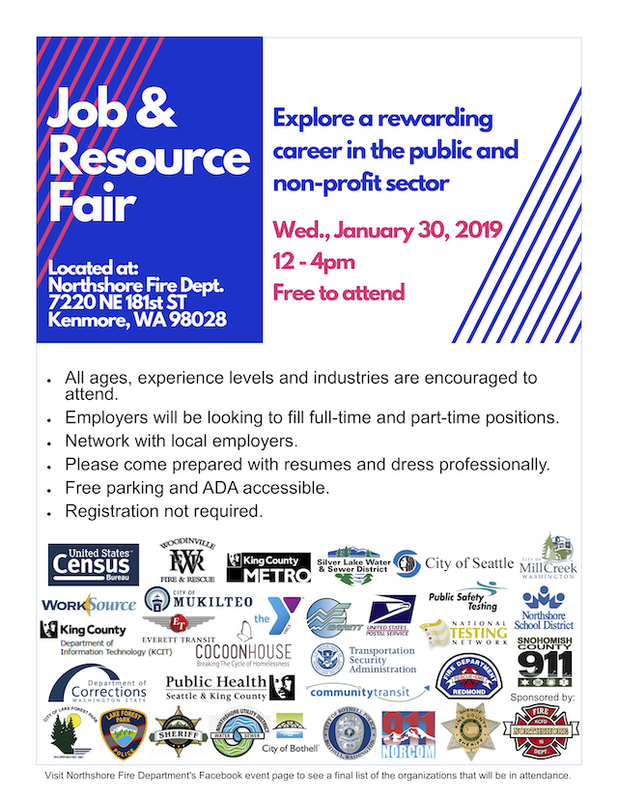 The City of Lake Forest Park has joined Northshore Fire for the Job and Resource Fair which will be held Wednesday, January 30, 2019 from noon to 4pm at the Northshore Fire station in Kenmore, 7220 NE 181st St. Candidates of all ages, experience levels, and industries are encouraged to attend. Organizations will be looking to fill full-time and part-time positions, so come prepared with resumes and dress professionally. The event and parking are free and the facility is ADA accessible. Registration is not required, but is requested to help the event coordinators plan for the number of attendees. Click here to register. Bothell Police Department, City of Bothell, City of Everett, City of Lake Forest Park, City of Mill Creek, City of Mukilteo, City of Seattle (Finance, Administrative Services, Seattle Animal Shelter, Fleet Mechanics), Cocoon House, Community Transit, Everett Transit, Kenmore Police Department/King County Sheriff, King County IT, Lake Forest Park Police Department, Monroe Correctional Complex, National Testing Network (NTN), NorCom, Northshore Fire Department, Northshore School District, Northshore Utility District, Public Health - Seattle / King County, Public Safety Testing (PST), Redmond Fire Department, Silver Lake Water and Sewer District, Sno911, Snohomish County Sheriff's Office (RN, Psychiatric, Corrections Deputy, Deputy Sheriff, Law Enforcement Technician, Airport Specialist, Benefit & Leave Administrator), Transportation Security Administration (TSA), U.S. Census Bureau, U.S. Post Office, Woodinville Fire and Rescue, Worksource, YMCA (Northshore).